For Salsa freaks, Alma Salsera is one of the year’s largest events on Okinawa. Sunday, for the third straight year, Alma Salsera takes center stage at the Spice Island Café in Mihama-Chatan. One of Japan’s top Salsa DJ’s, T-Rod, will host the musical festivities beginning at 7:30pm. Hiro, the owner of Latin Soul in Ginowan, is hosting and promoting the event. “We started this event three years ago,” he says, “and this year we’re expecting more people will join than last year.” Dance performances will be center stage, with teams coming from most of the salsa clubs on Okinawa. “Last year,” Hiro says, “a large number of people not only watched the performances, but were up and shaking their bodies with the Latin beat.” He says to expect other styles of dance such as Reggaeton and Belly Dance during the Sunday evening fun. Advance admission is Y2,000, while tickets at the door will be Y2,500. 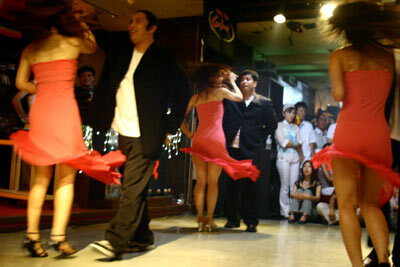 Tickets are available at a number of salsa clubs throughout Okinawa. In Naha area, contact Salsatina (098-868-8286), Salsa Caliente (098-868-6770), or Bosque (090-7475-8698). In the Ginowan area, call Latin Soul (090-1369-8466), El Chevere (090-7384-7596) or Studio Claverio (090-7475-8698).